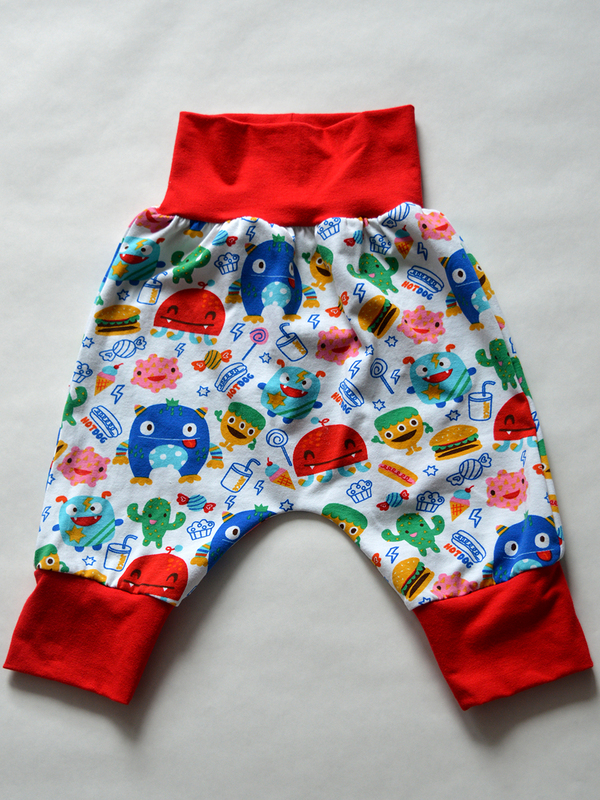 'So, Zo...': Monsters-and-snacks Pyjama Pants: PLUS, that myfabrics.co.uk discount code one last time! 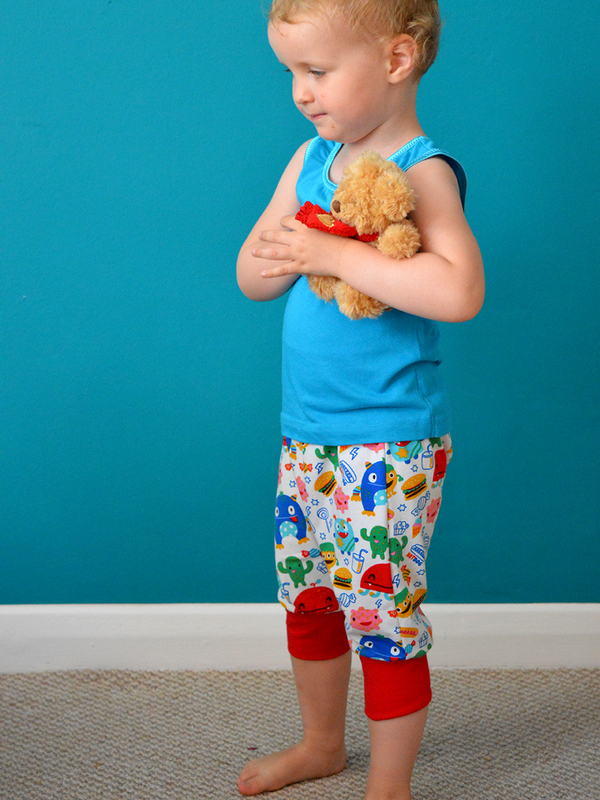 Monsters-and-snacks Pyjama Pants: PLUS, that myfabrics.co.uk discount code one last time! 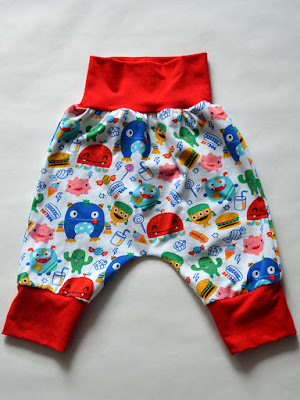 Here's my third and final project for The Cheeky One using knit given to me by myfabrics.co.uk, plus the last reminder about the month-long discount code that they have kindly offered my blog readers in UK and Ireland. Now I must admit that Dolores had nothing to do with picking out this final fabric selection. I just really liked it and *hoped* she would too when she saw it. When it arrived, she actually reacted rather neutrally to it, so I decided to introduce it into her wardrobe in a fairly neutral way: as pyjamas. Therefore, if she suddenly took an aversion to them (could happen), I can shrug my shoulders and pack them away for the mini-dude to wear when he's big enough, without having to see the awesomeness go to waste. As I'm typing this in mid-September, it's still really warm here in UK. So I thought a pair of jammie bottoms that will be suitable for the transition from summer to autumn would be a good plan. Enter: my trusty stash of Ottobre design magazines! Like the Spring 1/2013 issue, I also initially regarded the Summer 3/2013 issue to be a bit of a dud. Again, I was wrong. 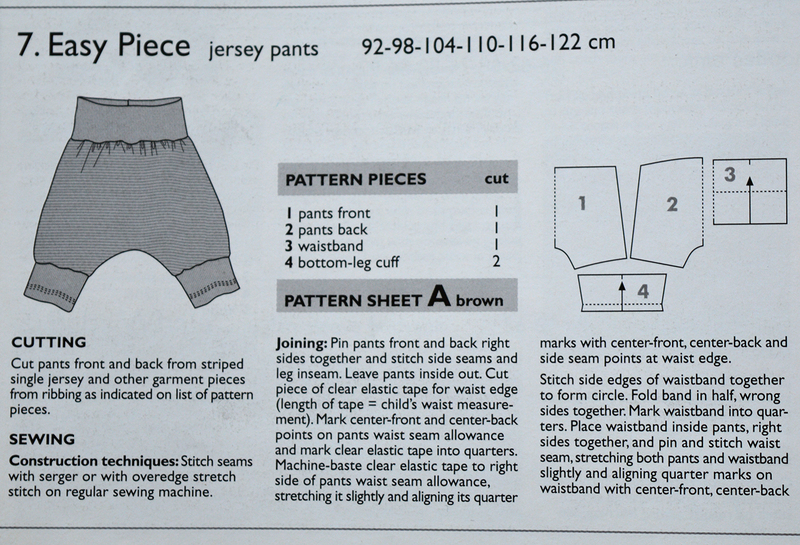 The Easy Piece jersey pants pattern looked suitably quick and simple to make, and comfy to wear. I combined the size 92 for the width and size 98 for the length, then decided to add an extra 2cm to the length of the legs so that the bottom-leg cuffs would be lower and less likely to get caught on her knees when she bends her legs. 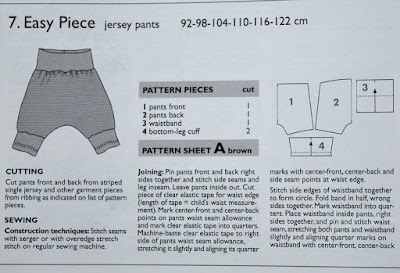 The time spent tracing the pattern pieces and adding seam allowances was paid back by a quick and easy construction process. Alongside these knit projects, I've recently been working on a pretty involved sewing project (to be disclosed in a month or so), so I needed these to be speedy or they might not've happened given my current size and energy levels. 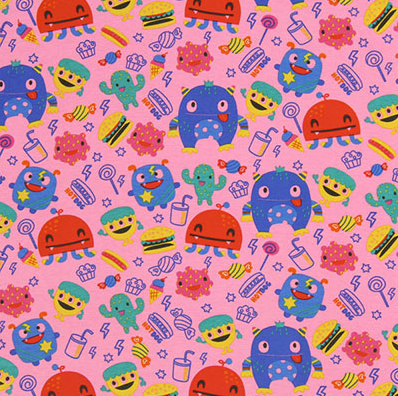 As with the lightning flash and pirate knits, this mental monsters-with-snack-foods print knit is also a medium-weight single jersey with excellent stretch and recovery. It also has quite a soft handle, all of which makes it perfect for kid's nightwear. Unfortunately, it looks like the colour way with the white background has sold out, but the pink version can be found here. The pattern calls for ribbing for the cuffs and waist band, but I only have grey and navy ribbing in my stash, so I used some solid red jersey instead (leftover from my leggings). It worked out pretty well, except I should have added a bit of width to the waistband as it has come out a little tight, probably because the red jersey doesn't have as much 'give' in it as a ribbing would. It's fine for now, but I was hoping these jammie bottoms would last Dolores a year or so. I reckon I'm going to have to remake and replace the waistband at some point in the spring. It's been so fun choosing and sewing with these knits, I'm very grateful for myfabrics.co.uk for the opportunity. If I got to do this another time, I'd probably focus on their selection of GOTS certified organic jersey and poplins that I only just saw that they stock. 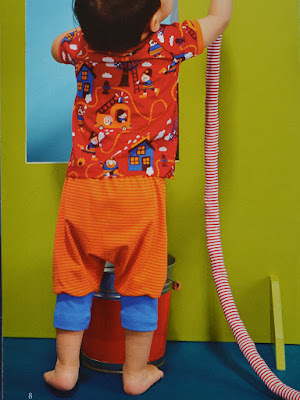 They've got some really cute printed poplin that would have been fun to work with, as I've only used organic knits to date and I'd like to see if the extra softness that organic knits seems to all have is true of organic wovens as well. So if you fancy splashing out on some of their stock, remember you have until the end of this month (September 2016) to use the following code: SoZo16 to receive £10 off your myfabrics.co.uk order (minimum order £60). The fine print is that the code can only be once per order, and once per customer, and not in combination with other vouchers. Oh my goodness - cuteness overload! Cute PJs. 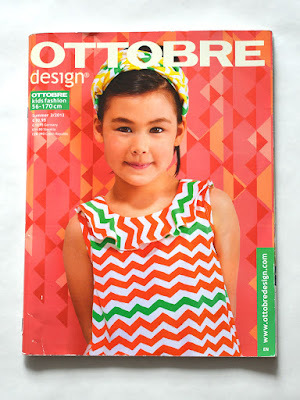 Thanks for introducing me to Octobre magazine,so inspiring. Dolores is so cute!!! 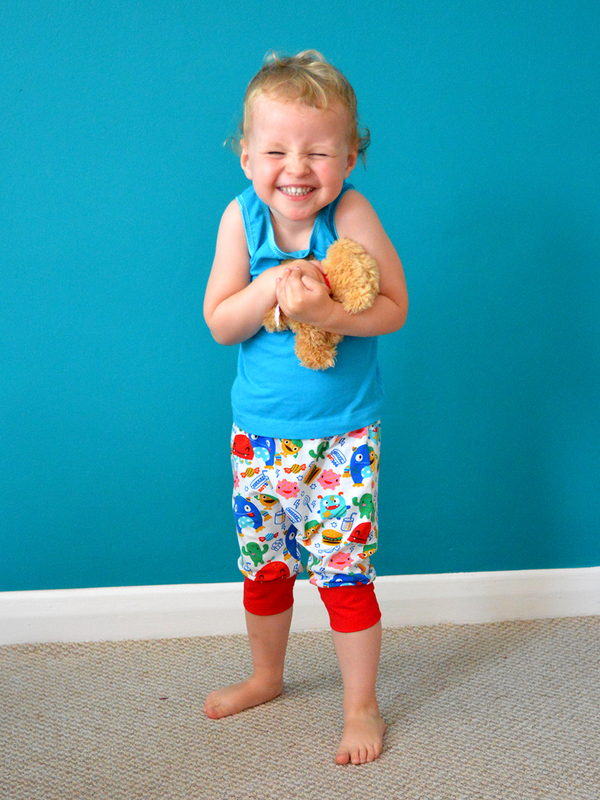 The PJ bottoms are pretty cute too! I've got a stack of jersey fabric washed & waiting to be made into toddler winter clothes - I better get on it before it's too late!